Add H3K27me2/3 monoclonal antibody - Classic to my shopping cart. Request a quote for a bulk order for H3K27me2/3 monoclonal antibody - Classic. Please fill out the form here below. Your local sales account manager will get in touch with you shortly and send you a quotation based on your requirements. Monoclonal antibody raised in mouse against histone H3, di- or trimethylated at lysine 27 (H3K27me2/3), using a KLH-conjugated synthetic peptide. 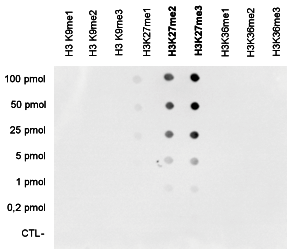 A Dot Blot analysis was performed to test the cross reactivity of the Diagenode monoclonal antibody against H3K27me2/3 (cat# MAb-014-050) with peptides containing other modifications of histone H3. Other modifications include mono-methylation of lysine 27 and mono-, di- and trimethylation of lysines 9 and 36. One hundred to 0.2 pmol of the peptide containing the respective histone modification were spotted on a membrane. The antibody was used at a dilution of 1:300. Histone extracts from HeLa cells (HeLa HE, 20 μg) were analysed by Western blot using the Diagenode monoclonal antibody against H3K27me2/3 (cat# MAb-013-050) diluted 1:1,000 in TBS-Tween containing 5% skimmed milk. The position of the protein of interest is indicated on the right. Diagenode strongly recommends using this:	H3K27me2/3 monoclonal antibody - Classic (Diagenode Cat# C15200014 Lot# 001). Click here to copy to clipboard.